Our family-owned and operated seafood markets in Titusville and Port Canaveral carry a wide selection of the ocean's best seafood. 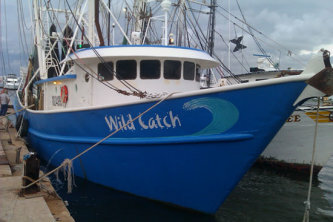 Wild Ocean Seafood Market is the place to buy fresh, quality seafood in Brevard County. Family-owned and operated for over four generations Wild Ocean has been serving Brevard County residents and the rest of the country from it's two locations on the Space Coast, one in Port Canaveral and the other in Titusville. Although they are a full service fresh seafood market they specialize in shrimp. Locals and tourists alike come from far and wide for their signature Florida Rock Shrimp. Wild Ocean takes careful precautions to ensure your seafood is delivered to our stores or you home in it's most pristine state. In other words as fresh as if you plucked it out of the ocean yourself. Their motto is "seafood the way it's supposed to be." And that is how they do business. From fishermen catching seafood locally and immediately flash freezing it on the boat, to sending it out using their gel pack cooling technology. Wild Ocean takes every measure possible to ensure that your purchase is delivered fresh to your door. Quality of the seafood they provide is also very important to Wild Ocean Seafood Market. Their committment is that you get the best and they strive for that with every order. Wild Ocean Seafood Market offers much more than just seafood they also offer farm fresh, cage-free eggs from a local source, Lake Meadow Naturals Farm. In addition to eggs they have grass-fed beef and organic products too. Their market provides food that has been harvested from naturally renewable and sustainable resources. It is also harvested at the height of the season so as to attain the best possible flavor. Until harvest the animals live free in their natural marine environment; in pristine, pollution-free waters. You can be confident that food you buy at Wild Ocean Seafood Market has not been fed antibotics or growth hormones. These guidelines adhered to by Wild Ocean ensure you experience the unmatched taste and quality of their seafood, beef and eggs.